How to act as an Air Traffic Controller using JoinFS. I've created a tool that will display JoinFS aircraft on Euroscope. For those that would like to try it, it can be found here. To use it with JoinFS. 2. Start the ESJFS tool. 3. Start Euroscope and click Connection. 5. RealName, Cerificate, and Password = ANYTHING you like. 6. Server = 127.0.0.1 or the word localhost. 7. Connect to VATSIM TickBox = Unticked. A picture of the settings I use is below. 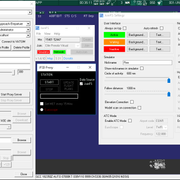 The tool will now also allow a connection directly to FSX/P3D or FSUIPC (And possibly XPUIPC). If connecting this way any Aircraft that is in your SIM will be shown on Euroscope. Handy if you don't want to use the default FSX radar or you use Xplane which doesn't come with a radar AFAIK. To see JoinFS traffic on the default FSX radar you must start as an ATC in the following order. 1.Start your sim and set up a Tower in Freeflight mode. 2.Open JoinFS and in the settings menu tick Enable ATC Mode and input the ICAO code for the airport you will be controlling. 3.Run the JoinFS client and connect to the network with your friends. But Roo how do I start the Tower in Freeflight mode? Yes there is no option to start the default FSX ATC Tower in Freeflight mode as there is in Multiplayer mode, but there is the option to load a saved flight. So if you are in multiplayer mode as a Tower you can save this flight to use in Freeflight mode. 1. Start FSX and go to Local Network LAN and click sign in. 2. Click Host a session (bottom right). 3. Select Freeflight for the session Type, put anything you like in the other boxes and click next. 4. Select Air Traffic Controller in the role drop down box, Select the airport you want to control, the weather you would like and the Time of day. 5. Click SAVE and save the flight as KLAX Tower (replace KLAX with the airport you chose). Complete steps 4 and 5 for every airport you would like to have quick access too when wanting to control. 6. Once all the airports you'd like are created, click back and sign out which should take you back to the main FSX login screen. 7. Select FreeFlight from the top left. 8. From the Free Flight screen select Load half way down the screen. 9. Select the Tower you would like to control at and click Fly Now. FSX Will load you into the Tower view at the airport you chose. If you have the AI aircraft enabled you will see them on the radar screen too. I would advise turning AI traffic off when controlling in Freeflight mode. I hope that helps anybody wanting to control aircraft using JoinFS and the ATC mode feature. Last edited by ATC Roo on Fri Nov 09, 2018 11:32 pm, edited 15 times in total. Thanks for this. A quick question, should I be able to see taxiing aircraft on the tower's radar monitor screen, or is it just airborne detections? You should see both Peter. Although I've edited my radar a lot so I'll check with the default shortly. There's a button bottom right of the radar controls which will filter ground, air or both. Just checked with the default radar. I don't see any JOINFS ground aircraft. Well there was one that flickered on and off as if one update would show it as on the ground and the next it would be airborne. It was stationary on the ground. Where as if I create an FSX AI aircraft on the ground on my PC running the radar I do see that. If I create an FSX AI on a LAN PC running JOINFS it does get broadcast to my other PC and shows on radar as on the ground. It looks like any aircraft the JOINFS client creates are created as airborne AI? ATC Roo wrote: Where as if I create an FSX AI aircraft on the ground on my PC running the radar I do see that. Yes, that's exactly right. When I create the network aircraft, I first create an AI aircraft with the Ground flag off, so yes it is basically airborne all the time as far as FSX is concerned. The problem is that in SimConnect you can't change this flag so I think FSX determines whether an aircraft is airborne itself. Perhaps the network position is causing it to keep touching and lifting off the ground slightly and causing the state to switch. This is something I can investigate. Peter wrote: [ Perhaps the network position is causing it to keep touching and lifting off the ground slightly and causing the state to switch. That's exactly what I thought and glad I was able to explain it. Also regarding the QNH/Altimeter setting . If the session that created the AI on is on a different pressure setting to the radar showing it, then it will show as airborne. I got around this by selecting the weather tick box in JoinFS so everybody had the same pressure. please read the first post of this thread for an update on using the radar program. We have a radar that works okay and doesn't seem to cause any issues Peter, if it helps: "Aircraft Radar"
I adapted it for use in Tower view and also internally in our 11 Squadron Typhoons. I'm going to add a new setting to JoinFS for 'ATC Mode' which will show the traffic on the default radar but the aircraft may act a bit funny, but that's not really a problem for the controller.